I’ve probably made more cinnamon rolls in the last year than I have in I don’t know how long. My coworkers are cinnamon roll addicts and since they are my guinea pigs for recipes, I tend to make them lots of cinnamon rolls. We’re continuing on with #PumpkinWeek today, which is hosted by Terri of Love and Confections. More than 30 bloggers are participating this round and sharing our pumpkin filled recipes with you. Check at the bottom of the post to see what everyone else has made! When thinking about what recipes I could make, it seemed only obvious to add a pumpkin filling to a classic cinnamon roll. 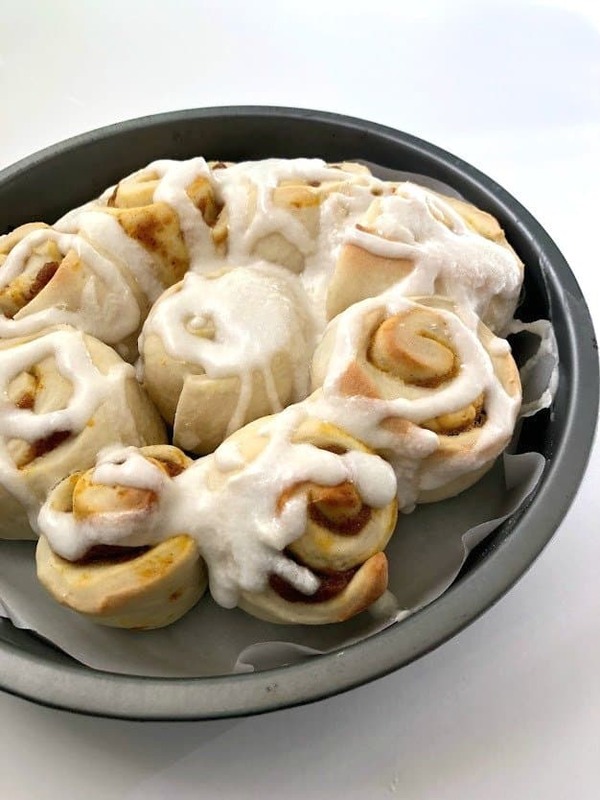 Pumpkin cinnamon rolls take your standard cinnamon roll up a notch with the addition of pumpkin puree and pumpkin pie spice. 1. Pour water into the bowl of your stand mixer. Sprinkle yeast and sugar on top. Let stand for 10 minutes. 2. Meanwhile, prepare the filling by adding the canned pumpkin, brown sugar, flour and pumpkin pie spice in a bowl and whisking until fully combined. Set aside. 3. Preheat the oven to 400 degrees. Line two cake pans with parchment paper or spray with cooking spray. 4. Once the yeast mixture is frothy, add the salt and butter to your stand mixer and stir in by hand. Switch to the dough hook and slowly add in the flour, 1 cup at a time until a soft dough forms and no longer sticks to the side of the bowl. 5. Turn out the dough onto a lightly floured surface and divide in half. Roll out each piece of dough into a 9×11 rectangle. Spread half of the filling mixture down the center of each, leaving a 1-inch border of dough and then roll up lengthwise, tucking in the ends. 6. Slice each roll into 6 pieces and arrange in a circle in the prepared baking dish. Cover and let rest for 5 minutes. 8. 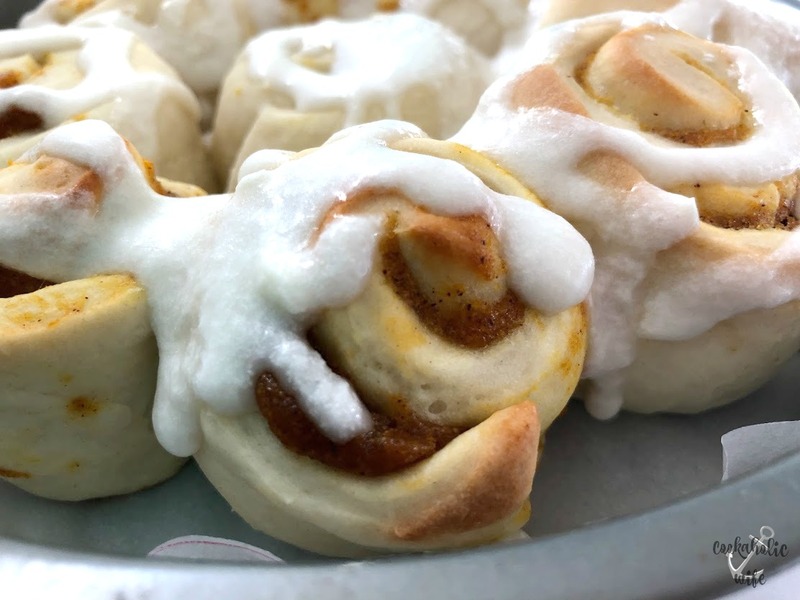 While baking, prepare the glaze by adding the almond milk, vanilla and powdered sugar to the bowl of your stand mixer and mixing on low speed until fully combined and of the right consistency to drizzle. 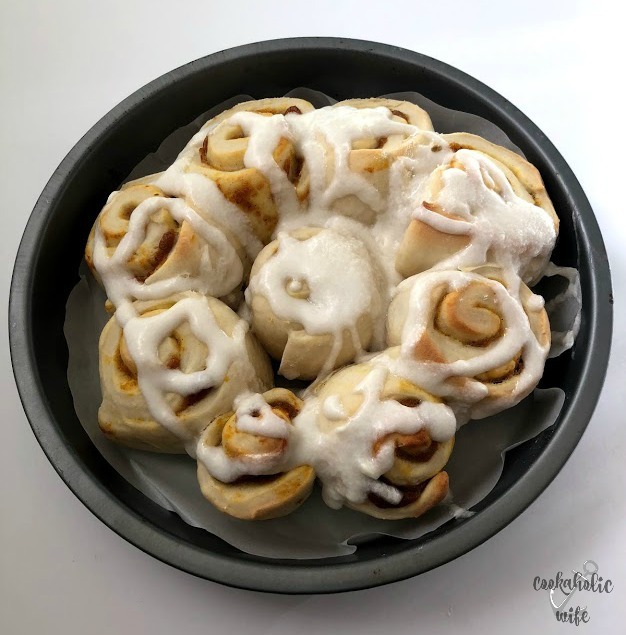 Aren’t these cinnamon rolls perfect for fall? 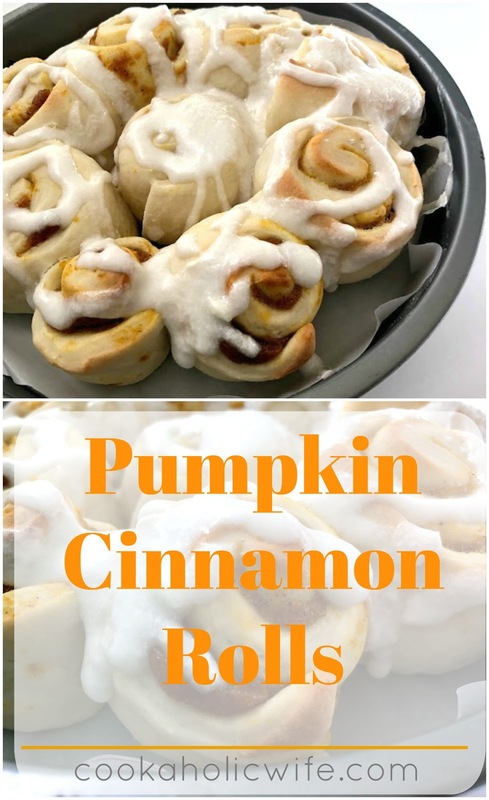 My favorite cinnamon roll recipe is a pumpkin one – I haven't made them in forever!! I will have to try this one! Great idea Nichole, perfect to serve on a Thanksgiving Brunch Buffet.